In addition to the decline, June saw another interesting feature: this sort of spam was not sent out on Saturdays or Sundays. The same situation could be observed in KSN: the number of email antivirus detections dropped sharply on 1 June and grew on 22 June. This decline was caused by a temporary lull in activity by the Necurs botnet, which is mostly used to distribute this type of malicious spam. After the botnet resumed its activity, the spam email template changed, and the malicious attachments became even more sophisticated. For example, some emails (see the screenshot above) contained an attachment with a Trojan downloader. When run, it downloaded Trojan-Ransom.Win32.Locky.agn, which encrypts the data on a victim’s computer and demands a ransom, to be paid in bitcoin. The second quarter saw spammers continue to mask links using various Unicode ranges designed for specific purposes. 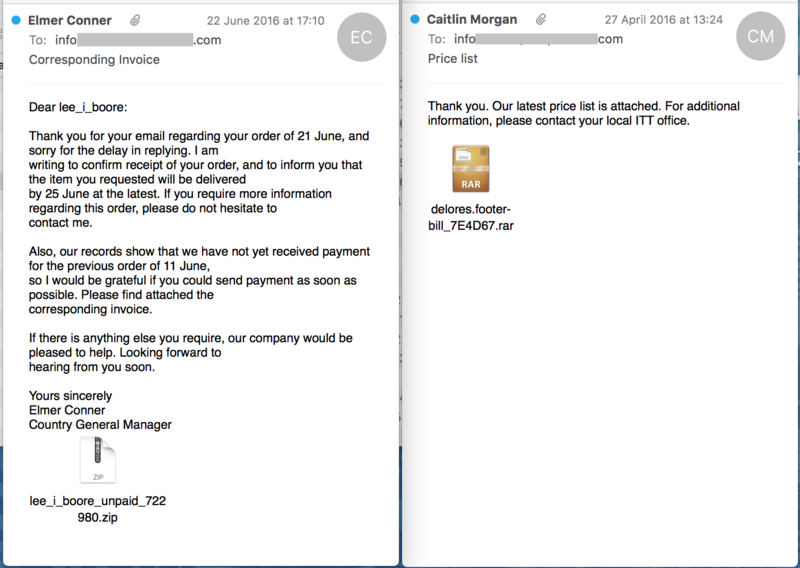 This tactic became especially popular in 2015, and is still widely used by spammers. If you transfer the domain from UTF-8 into the more familiar HTML, it becomes . The characters, which look quite ordinary, in fact belong to the Mathematical Alphanumeric Symbols UTF range used in highly specific mathematical formulas, and are not intended for use in plain text or hyperlinks. The dot in the domain is also unusual: it is the fullwidth full stop used in hieroglyphic languages. The rest of the hyperlink, as well as the rest of the text in these spam messages, is written using the Latin alphabet. In Q2, we came across a number of APT attacks in the corporate sector. Emails were made to look as if they came from representatives of the targeted company, and contained a request to immediately transfer money to a specific account. The text was fairly plausible and hinted at a personal acquaintance and previous communication. In some cases, the emails included the logo of the attacked company. All the messages conveyed a sense of urgency (“ASAP”, “urgent”, “must be completed today”) – scammers often use this trick in an attempt to catch people off guard, so that they act rather than think. The emails were sent selectively – to individual employees, usually connected to the finance department. 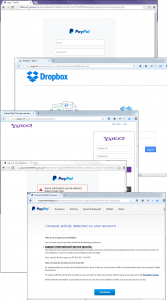 The knowledge shown by the scammers suggests the attack was carefully prepared. The most suspicious aspect of the attack was the domain used in the ‘From’ field – myfirm.moby – that differed from the corporate one. Perhaps the attackers hope that some email clients only show the sender’s name by default, while concealing the address. It is not that difficult to write any domain in the ‘From’ field, and in the future we can expect more well-prepared attacks. Spam mailings exploiting real-life events have long become an integral part of junk email. Sporting events are not as popular among spammers as political events, although their use is increasing with every year. There is a continuous stream of emails mentioning various political figures, while sport-related spam messages usually only appear in the run-up to an event. However, we have noticed that mass mailings can now be launched long before an event starts. For instance, emails exploiting the Olympic Games in Brazil were discovered over a year ago, in the second quarter of 2015. The majority of them were fraudulent emails designed to trick recipients and steal their personal information and money. The classic scenario involves false notifications about lottery wins related to 2016 Olympics. The messages claim that the lottery was held by the official organizers of the games and the recipient was selected at random from millions of addresses. In order to claim the cash, the recipient has to reply to the email and provide some personal information. The text of the message was often contained in an attached file (.pdf, .doc, .jpg), while the body of the message only displayed a short text prompting the recipient to open the attachment. There were also more traditional messages where the spammer text was included directly in the body of the message. In addition to fraudulent messages, advertising spam was also sent out. Unlike the Olympics, football tournaments have long been used by scammers to grab people’s attention to their spam. 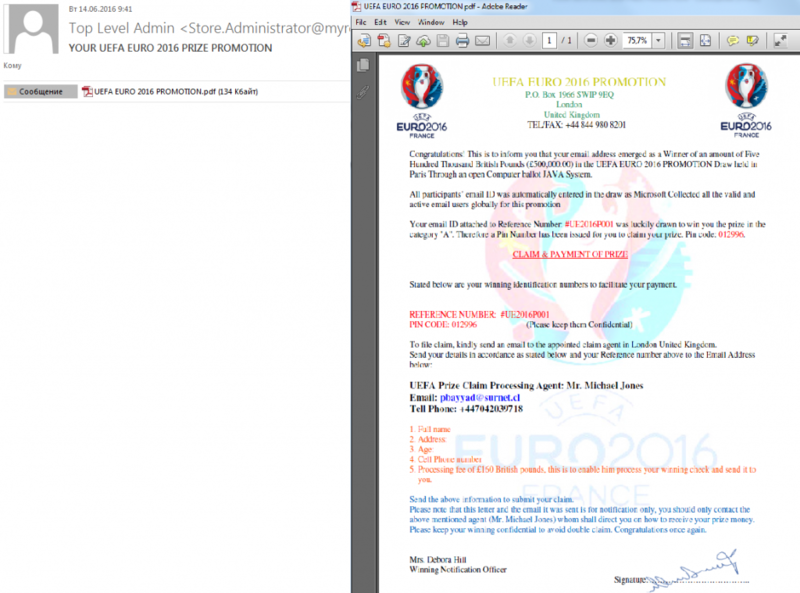 Q2 2016 saw the long-awaited UEFA European Championship, and in the run-up to the tournament spam traffic included fake notifications of lottery wins. The content was no different from that dedicated to the Olympic Games, and the emails also contained attachments explaining why the message was sent. The football theme was also exploited by ‘Nigerian’ scammers. They sent out emails supposedly on behalf of the former FIFA president, and used the infamous corruption scandal associated with his name to make their messages look more realistic. They believed that a fabricated story about how Sepp Blatter had supposedly received money and secretly transferred it to an account in a European bank would not arouse suspicion. In return for keeping the money in their bank accounts, the recipients were promised a 40% cut of the total sum. In order to convince recipients that the message was genuine, the authors even went to the trouble of using the correct name and domain in the ‘From’ field. The presidential election campaign is now in full swing in the United States and the nominees and their entourages are under close media scrutiny. 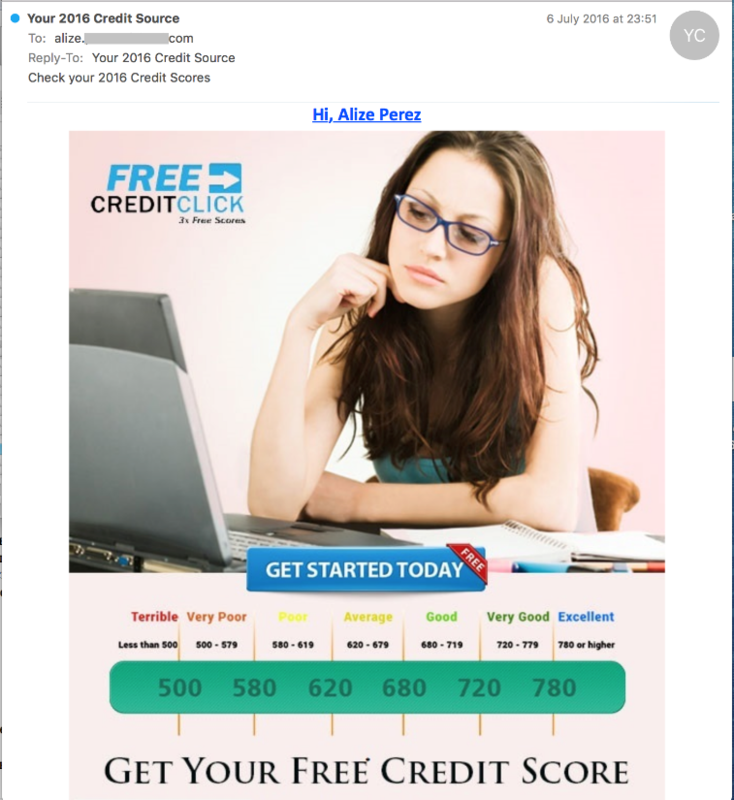 Of course, spammers couldn’t resist using the names of high-profile politicians in their advertising and fraudulent emails. For example, numerous ‘Nigerian’ letters were sent in the name of current president Barack Obama and his wife Michelle. In their ‘official’ emails, the ‘President’ and the ‘First lady’ assured the recipient that a bank card or a check for a very large sum of money had already been issued in their name. The only thing the recipient had to do was complete some formalities, and the money would be delivered shortly afterwards. 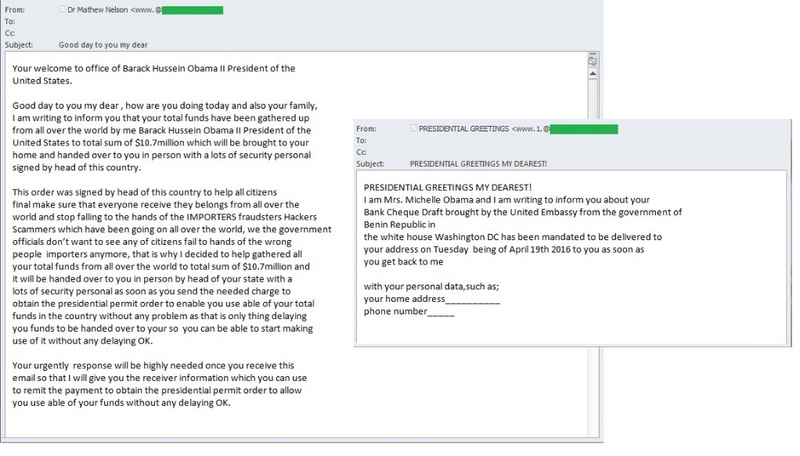 In order to get the instructions from the White House the recipient had to send some personal information, including their email address and the password for their email account, as well as detailed passport information to spoofed email addresses. Another politician whose name regularly cropped up in spam was Donald Trump, one of the contenders for the US presidency. 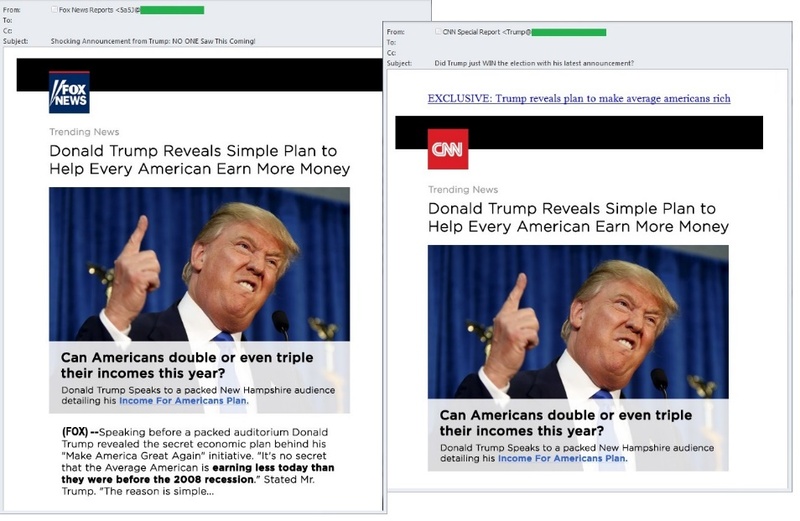 Spammers offered a unique Trump technique for earning money online: anyone who wanted to know how to get rich, had to click a link in the emails which were designed to look like news reports from CNN and Fox News. The links led to fake news sites also in the style of major media outlets and news networks. The sites contained a story about a simple method for earning money – the publication of links, which is basically another kind of spam distribution. In order to participate in the program, a user had to register by providing their phone number and email address. 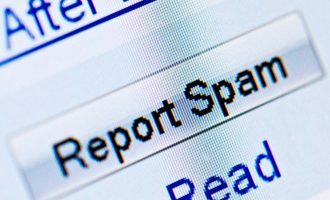 The largest percentage of spam in the second quarter – 59.46% – was registered in May and was 3 p.p. more than in April. 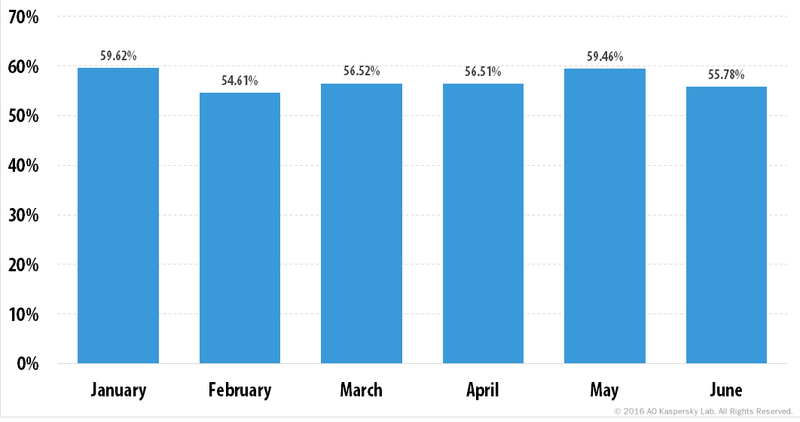 The average percentage of spam in global email traffic for Q2 amounted to 57.25%. In Q2 2016, the biggest three sources of spam remained the same as in the previous quarter – the US (10.79%), Vietnam (10.10%) and India (10.01%). However, the figures for each country changed: the gap between them narrowed to within a single percentage point. China (6.52%) moved up to fourth with an increase of 1.43 p. p. compared to Q1. Mexico (4.55%) came fifth, followed by Russia (4.07%) and France (3.60%). Brazil (3.28%), which was fourth in the previous quarter, lost 2.2 p.p. and dropped to eighth place. Germany (2.97%) and Turkey (2.30%) completed the TOP 10. Traditionally, the most commonly distributed emails are very small – up to 2 KB (72.26%), although the proportion of these emails dropped by 9.6 p.p. compared to the previous quarter. 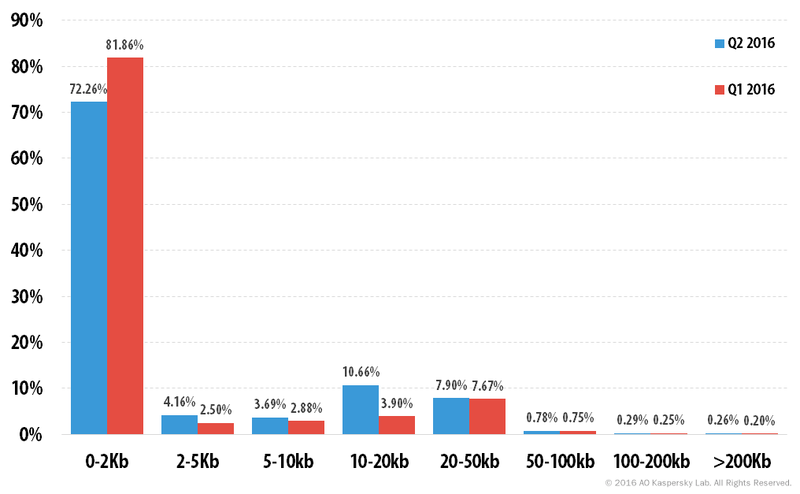 Meanwhile, the share of emails sized 10-20 KB increased by 6.76 p.p. The other categories saw minimal changes. Currently, the majority of malicious programs are detected proactively by automatic means, which makes it very difficult to gather statistics on specific malware modifications. So we have decided to turn to the more informative statistics of the TOP 10 malware families. The three most popular malware families remained unchanged from the previous quarter – Trojan-Downloader.JS.Agent (10.45%), Trojan-Downloader.VBS.Agent (2.16%) and Trojan-Downloader.MSWord.Agent (1.82%). The Trojan.Win32.Bayrob family moved up to fourth place (1.68%), while the Backdoor.Win32.Androm family fell from fourth to ninth place with 0.6%. A newcomer to this ranking was the Trojan.Win32.Inject family (0.61%). The malicious programs from this family embed their code in the address space of other processes. The Trojan-Spy.HTML.Fraud family (0.55%) rounded off the TOP 10 in Q2 2016. 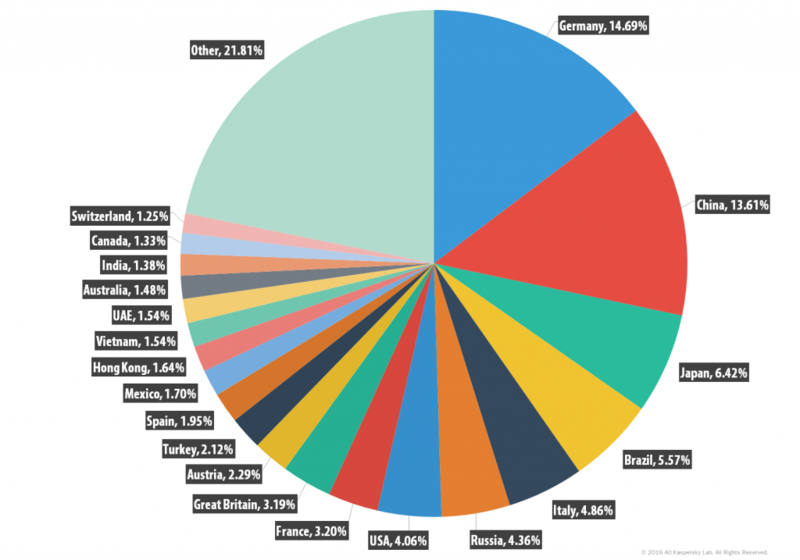 Germany (14.69%) topped the ranking of countries targeted by malicious mailshots, although its share decreased 4.24 p.p. It was followed by China (13.61%) whose contribution grew 4.18 p.p. Japan (6.42%) came third after ending the previous quarter in seventh with a share of 4.29%. Fourth place was occupied by Brazil (5.57%). Italy claimed fifth with a share of 4.9% and Russia remained in sixth (4.36%). The US (4.06%) was the seventh most popular target of malicious mailshots. Austria (2.29%) rounded off this TOP 10. In Q2 2016, the Anti-Phishing system was triggered 32,363,492 times on the computers of Kaspersky Lab users, which is 2.6 million less than the previous quarter. 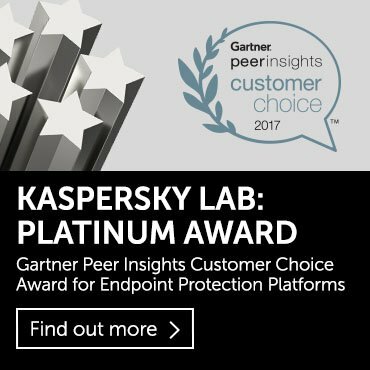 Overall, 8.7% of unique users of Kaspersky Lab products were attacked by phishers in Q2 of 2016. 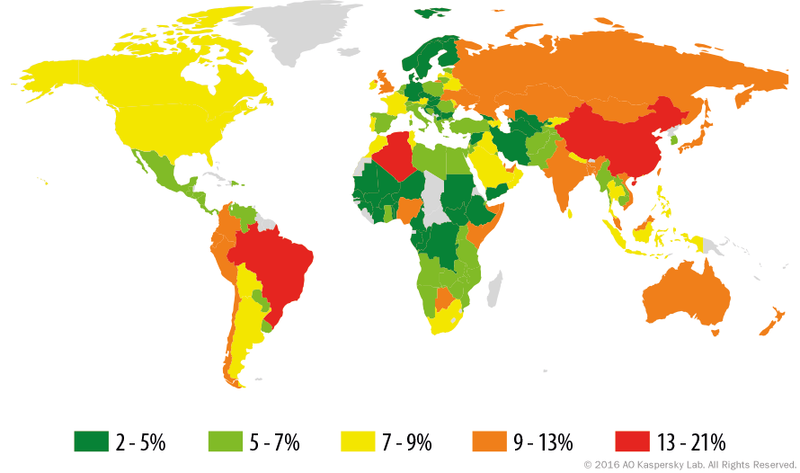 The country where the largest percentage of users is affected by phishing attacks was China (20.22%). In Q2 2016, the proportion of those attacked increased by 3.52 p.p. The percentage of attacked users in Brazil decreased by 2.87 p.p. and accounted for 18.63%, placing the country second in this ranking. Algeria (14.3%) came third following a 2.92 p.p. increase in its share compared to the previous quarter. 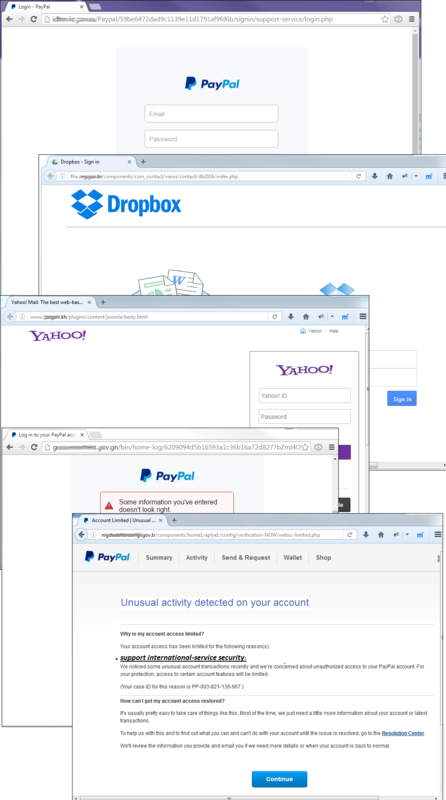 The statistics on phishing targets are based on detections of Kaspersky Lab’s heuristic anti-phishing component. It is activated every time a user attempts to open a phishing page while information about it has not yet been included in Kaspersky Lab’s databases. It does not matter how the user attempts to open the page – by clicking a link in a phishing email or in a message on a social network or, for example, as a result of malware activity. 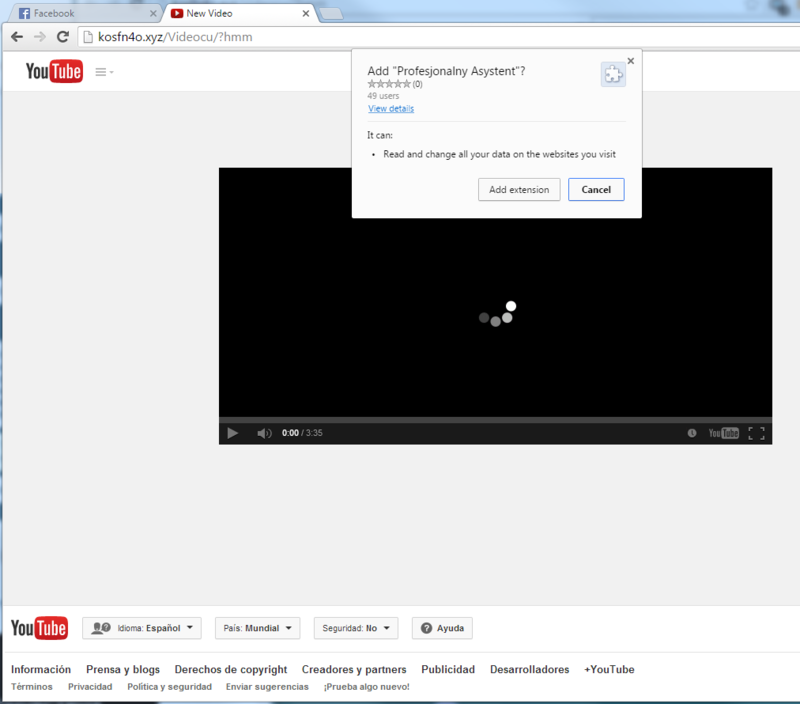 After the security system is activated, a banner is displayed in the browser warning the user about a potential threat. In Q2 of 2016, the share of the ‘Global Internet portals’ category (20.85%), which topped the rating in the first quarter, decreased considerably – by 7.84 p.p. The share of the ‘Financial organizations’ category grew 2.07 p.p. and accounted for 46.23%. This category covers ‘Banks’ (25.43%, +1.51 p.p. ), ‘Payment systems’ (11.42%, -0.42 p.p.) and ‘Online stores’ (9.39%, +0.99 p.p.). The share of attacks on the ‘Social networking sites’ category increased by 2.65 p.p. and reached 12.4%. The ‘Online games’ category was also attacked more often (5.65%, + 1.96 p.p.). Meanwhile, the ‘Telephone and Internet service providers’ (4.33%) and the ‘IMS’ (1.28%) categories lost 1.17 p.p. and 2.15 p.p. respectively. For a number of years now Brazil has been among the countries with the highest proportion of users targeted by phishing. 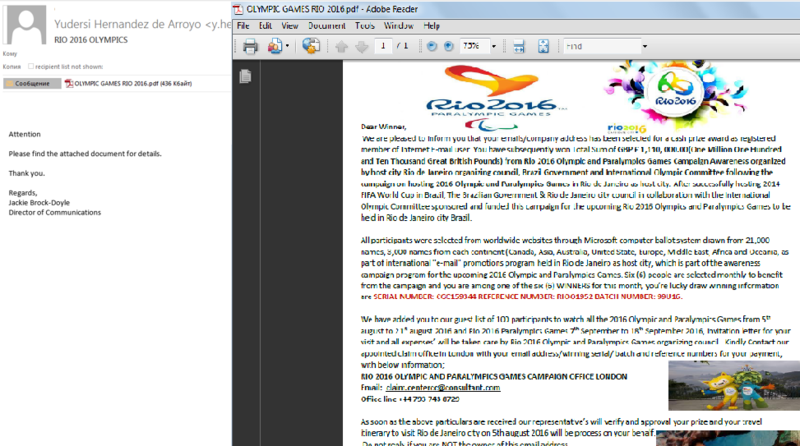 In 2015 and 2016 phishers have focused on the Rio Olympic Games in Brazil. Last quarter showed that as well as ordinary users, the potential victims of phishing included the organizers of the Olympic Games. The Olympic theme remained popular in Q2, with phishers working overtime to send out fake notifications about big cash wins in a lottery that was supposedly organized by the Brazilian government and the Olympic Committee. Facebook users are often subjected to phishing attacks. During one attack in the second quarter, a provocative video was used as bait. To view it, the user was directed to a fake page imitating the popular YouTube video portal, and told to install a browser extension. This extension requested rights to read all the data in the browser, potentially giving the cybercriminals access to passwords, logins, credit card details and other confidential user information. The extension also distributed more links on Facebook that directed to itself, but which were sent using the victim’s name. 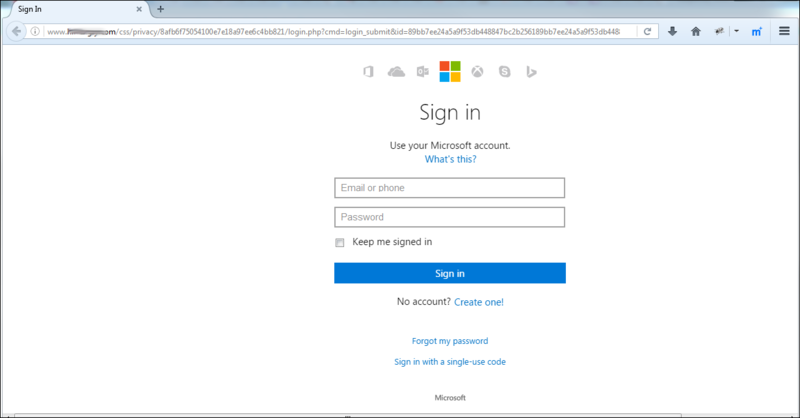 To bypass security software filters, fraudsters try to place phishing pages on domains with good reputations. This significantly reduces the probability of them being blocked and means potential victims are more trusting. The phishers can strike it big if they can use a bank or a government agency domain for their purposes. 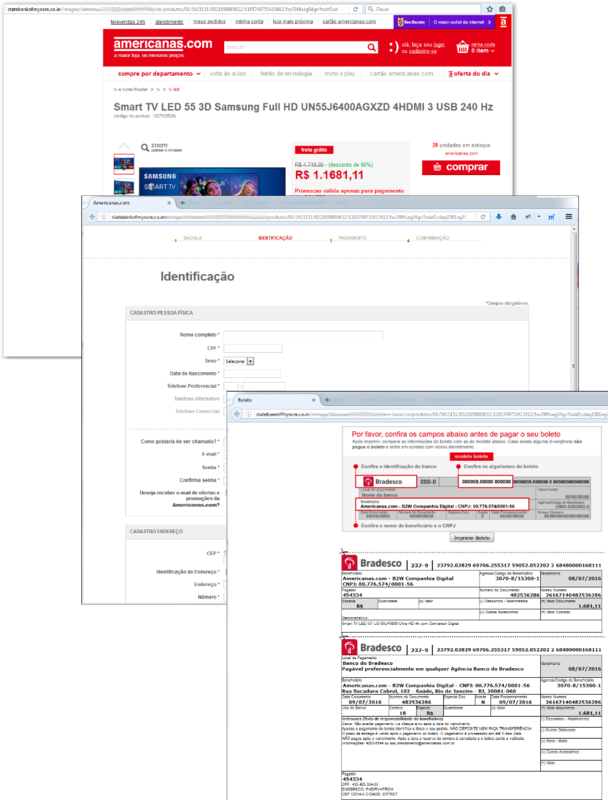 In Q2, we came across a phishing attack targeting the visitors of a popular Brazilian e-commerce site: the fake page was located on the domain of a major Indian bank. This is not the first time fraudsters have compromised the domain of a large bank and placed their content on it. 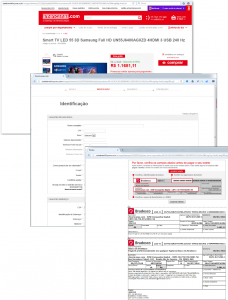 When trying to purchase goods on the fake pages of the store, the victim is asked to enter lots of personal information. When it’s time to pay, the victim is prompted to print out a receipt that now shows the logo of a Brazilian bank. The probability of these links being placed on blacklists is negligible thanks to the reputation of the domain. Fraudsters continue to focus most of their attention on the most popular brands, enhancing their chances of a successful phishing attack. 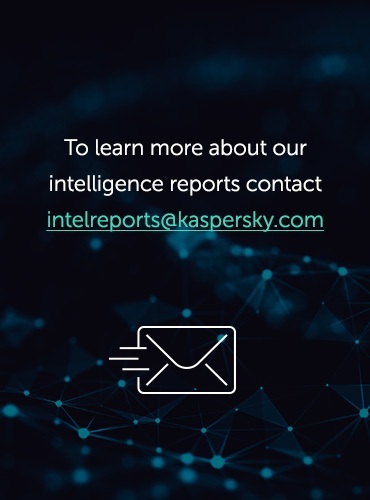 More than half of all detections of Kaspersky Lab’s heuristic anti-phishing component fall on phishing pages hiding behind the names of fewer than 15 companies. The TOP 3 organizations attacked most frequently by phishers accounted for 23% of all phishing links detected in Q2 2016. In Q2 2016, this TOP 3 ranking saw a few changes. Microsoft was the new leader with 8.1% (+0.61 p.p. ), while Facebook (8.03%, +2.32 p.p.) came second. The share of attacks targeting Yahoo! (6.87%) fell 1.46 p.p., leaving last quarter’s leader in third. Q2 leader Microsoft is included in the ‘Global Internet portals’ category because the user can access a variety of the company’s services from a single account. This is what attracts the fraudsters: in the event of a successful attack, they gain access to a number of services used by the victim. In the second quarter of 2016, the proportion of spam in email traffic increased insignificantly – by 0.33 p.p. – compared to the previous quarter and accounted for 57.25%. 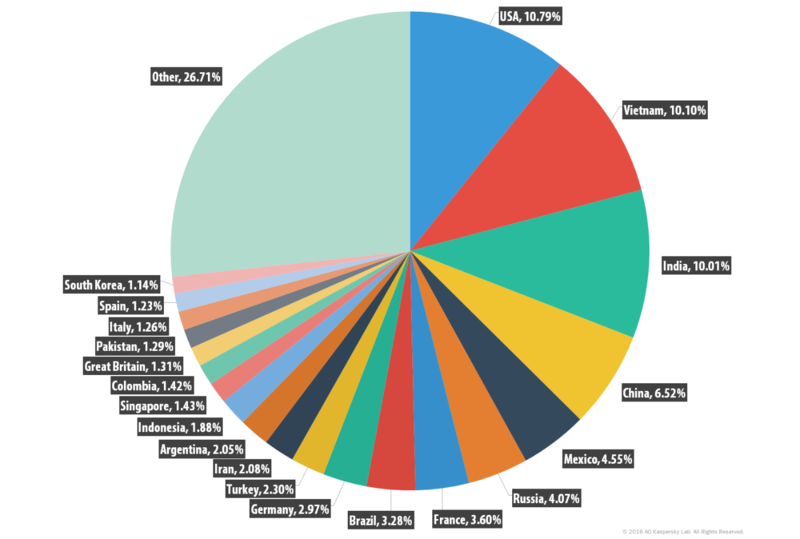 The US remained the biggest source of spam. As in the previous quarter, the top three sources also included Vietnam and India. Germany was once again the country targeted most by malicious mailshots, followed closely by China. Japan, which was seventh in the previous quarter’s ranking, completed the TOP 3 in Q2. Trojan-Downloader.JS.Agent remained the most popular malware family distributed via email. Next came Trojan-Downloader.VBS.Agent and Trojan-Downloader.MSWord.Agent. A significant amount of malicious spam was used to spread ransomware Trojans such as Locky. For almost a month, however, cybercriminals did not distribute their malicious spam, but then the Necurs botnet began working again. We don’t expect to see any significant reduction in the volume of malicious spam in the near future, although there may be changes in email patterns, the complexity of the malware, as well as the social engineering methods used by attackers to encourage a user to launch a malicious attachment. 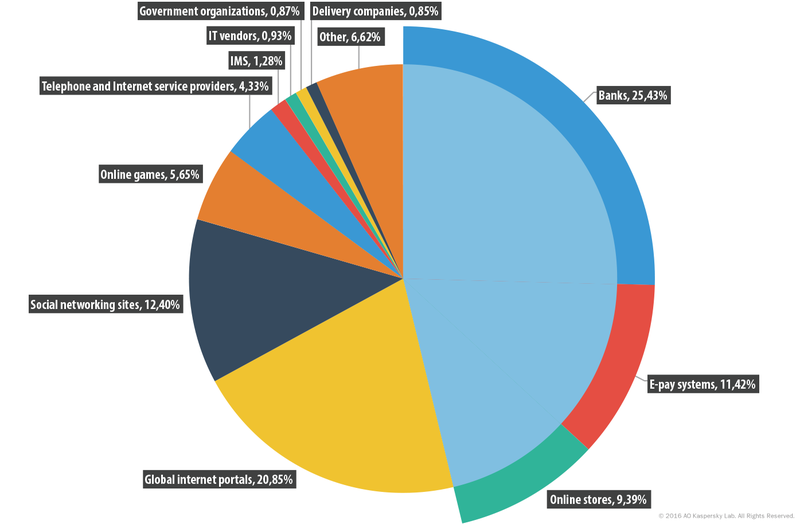 The focus of phishing attacks shifted slightly from the ‘Global Internet portals’ to the ‘Financial organizations’ category. The theme of the Olympic Games was exploited by both phishers and spammers to make users visit fake pages with the aim of acquiring their confidential information or simply to get their money. Events in the political arena, such as the presidential election in the US, also attracted spammers, while the sites of government agencies were compromised in phishing attacks. As we can see, the overriding trend of the quarter is that of fraud and making quick money from victims using direct methods such as Trojan cryptors that force unprotected users to pay a ransom, or phishing attacks that target financial organizations, rather than long drawn-out scams. All of this once again highlights the need for both comprehensive protection on computers and increased vigilance by Internet users.